Teacher Refresher courses offer you the possibility of developing your insight into language teaching methodology (primary, secondary or adult learners) and at the same time improving your own command of English. The sessions are designed for non-native speakers of English who have experience of teaching English as a foreign language or have gained a teaching qualification in their own country. The courses bring together teachers from many different countries and present the opprtunity for you to share ideas and experience. Certificate of attendance is issued by the corresponding school. Entry level B2 (FCE). TKT - Teaching Knowledge Test focuses on core teaching knowledge aimed at teachers of primary, secondary or adult learners worldwide. Ideal for all teachers, whatever your background and teaching experience, or for people who would like to teach English but do not yet have a teaching position. Entry level B1&B2 (FCE). This intensive course open to native and non-native speakers of English (4 weeks of 7 hours a day of lectures, tutorials and teaching practice) is continually assessed and in the final week students sit a written exam in language awarness and phonology and take part in a Trinity moderation interview. 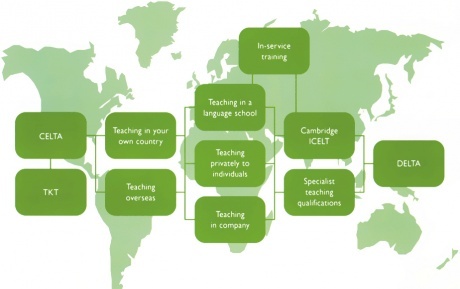 Trinity CertTESOL is recognised as a suitable initial qualification for teaching English to speakers of other languages so enabling you to teach in any country in the world where there is a demand for English. Entry level C2 (CPE) or equivalent with little or no experience of teaching English and a minimum qualifications for entry to higher education in the UK or applicants' own education systems. CELTA - The Cambridge Certificate in English Language Teaching to Adults focuses on both written and practical teaching assignments. It is open to both native and non-native speakers of English. There is no final examination. The assessment is validated by a visiting Cambridge appointed external assessor. Certificates and reports are sent out approximately one month later after the results have been validated by Cambridge. Entry level C2 (CPE) or equivalent plus standard of education which would allow entry to higher education with little or no previous experience of teaching languages. The DipTESOL is an internationally respected qualification for experienced teachers of ESOL/EFL capable of being academic managers and teacher trainers. It is accepted by the British Council as a full TEFL qualification for teachers in its accredited teaching organizations in the UK and in its own teaching operations overseas. The Diploma is awarded when a candidate successfully completes all 4 parts of the examination: the written paper, the corse work, phonetics and phonology and classroom teaching practice. Entry level C2 (CPE) or equivalent, opened to native and non-native teachers with a university degree or equivalent and at least 2 years full time experience of TESOL. The portfolio of assignments consists of three components: coursework including practical and written assignments, extended assignment and written examination. All three components must be completed and submitted to Cambridge at the end of the course to be marked and/or moderated by an external moderator. Results are issued approximately 12 weeks after the examination. Entry level C2 (CPE) or equivalent plus a minimum of two years full-time experience of English language teaching to adults at different levels within the past 5 years plus first degree in higher education or previously undertaken CELTA or ICELT course.